Wednesday March 23rd 1898 I practice a little while today and did the work. I was over to Emmas in the afternoon. I knit a little. The men were busy about the place Thursday March 24th 1898 Will took the meat up to Aunt Ellens to smoke and then went to a sale with the boys. He bought a riding plow. I was looking after some work out doors and put in some time at the piano. This is Father's birthday. He is eighty years old. Friday March 25th 1898 Will took the marketing up town and did not come back till late in the afternoon. I was over to Emmas to see about the kettle to make soap. I got it home and weighed the grease to put in it. I put in some time at the piano - took my final lesson of Miss [Deor?] and read in the evening. All well as usual up home. 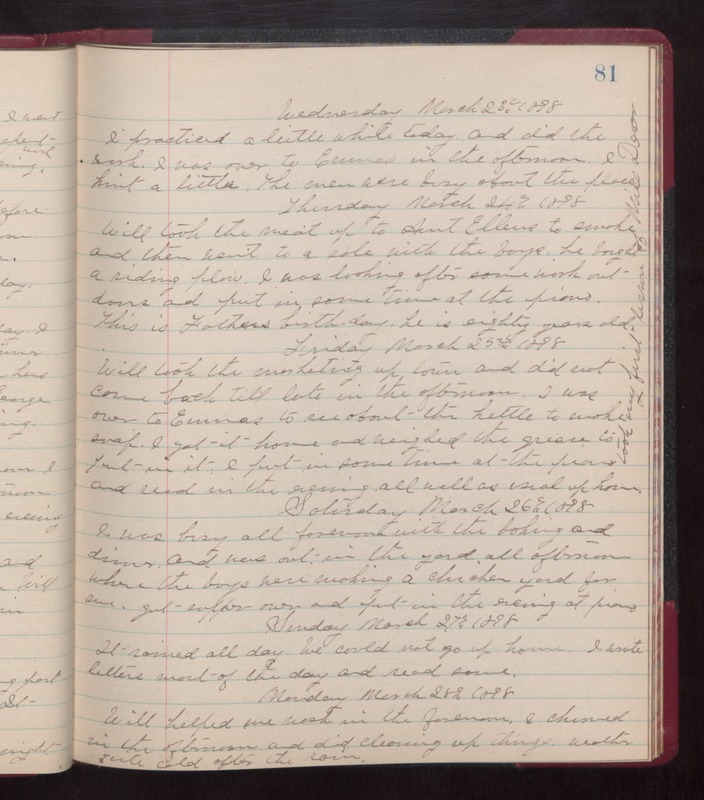 Saturday March 26th 1898 I was busy all forenoon with the baking and dinner and was out in the yard all afternoon where the boys were making a chicken yard for me. Got supper over and put in the evening at piano. Sunday March 27th 1898 It rained all day. We could not go up home. I wrote letters most of the day and read some. Monday March 28th 1898 Will helped me wash in the forenoon. I churned in the afternoon and did cleaning up things. weather quite cold after the rain.